The broken down car on the slip road at junction 41. Police are warning motorists to take care on the roads after several weather related crashes already today. There are currently delays on the M621 at junction one due to an accident where a Mini is reported to be on its side. West Yorkshire Police have advised people heading to that area to take care and there is slow moving traffic on the M1 which is possibly as a result of that and an earlier crash on the southbound carriageway near to junction 39. There is also a broken down car near the junction 41 slip road on the M1 with Highways England currently en route. Officers have so far this morning dealt with reports of "several" collisions and are warning people to drive to the weather conditions being caused by prolonged heavy rainfall. 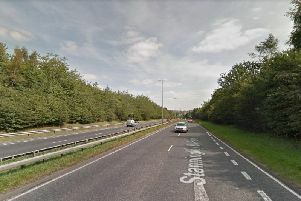 Elsewhere in the region there were problems on the M62 near junction 29 being caused by a stationary wagon in the middle lane but the Highways Agency say this has now been cleared.